When life gives you lemons, forget the lemonade. Instead, make an extra-dry martini with a twist (so much more refreshing). But hold on – why is it so bad to get a bunch of lemons anyway? Lemons are lovely (just think about that martini) and we can all use a whack of sour in our lives, can’t we? Sour is good. Sour makes your lips pucker and wakes your mouth up. Not to mention that thanks to lemons you don’t run around like a toothless sailor with a bad case of rickets. Lemons are essential any time of the year but they’re much appreciated in the cold, dark, dregs of winter when we really need something – dare I say it? – zippy. 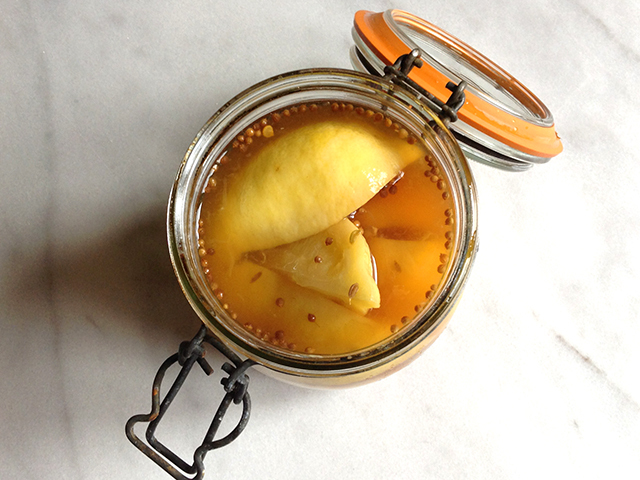 And there is nothing zippier than a jar of preserved lemons. 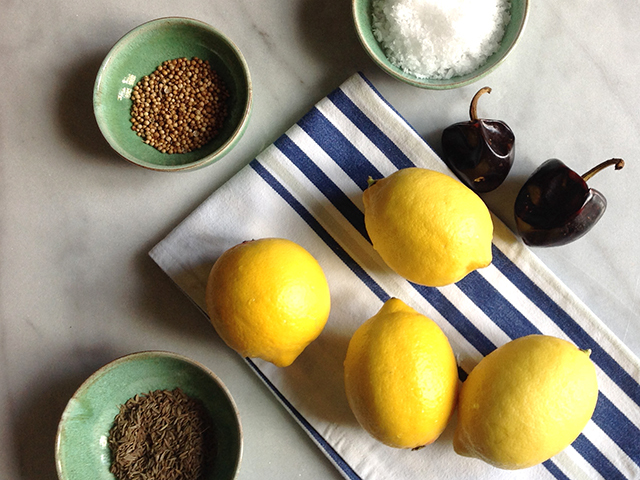 Loved in Middle Eastern cooking, preserved lemons are a must on any shelf. Now you may be lucky enough to have a grocery store near you that sells them but don’t bother. Save your money. Preserved lemons are a dawdle to make. The only caveat is that they should sit in their wee glass jar and steep for about 4 weeks before you use them. However, there are lots of recipes for ‘quick’ preserved lemons although lets be honest, there’s not a lot of preserving going on in a few hours. How to use them once they’re done? The real question is how not to – they’re incredibly versatile. You use the flesh and can chop that up and add it to stews, tajines, roasted veg, salads – you name it. Of course, never content to let well enough alone, I add chile and other spices to give it an extra kick. So sue me. I can’t help myself. If chile is the food of love — and let’s be honest, it is — this is the perfect Valentine’s recipe. If you can, use unwaxed lemons because be honest, do you really want to eat a bunch of wax? The recipe is for four lemons but you can scale it up or down based on the number of lemons you’ve got. Basic math is that you’ll need a tablespoon of sea salt and the juice of a lemon for each lemon you’re using. Get a jar that’s just large enough to fit your lemons. Fill the jar with boiling water, let it sit for a minute then empty the water out. Let the jar dry and it’s ready to go. 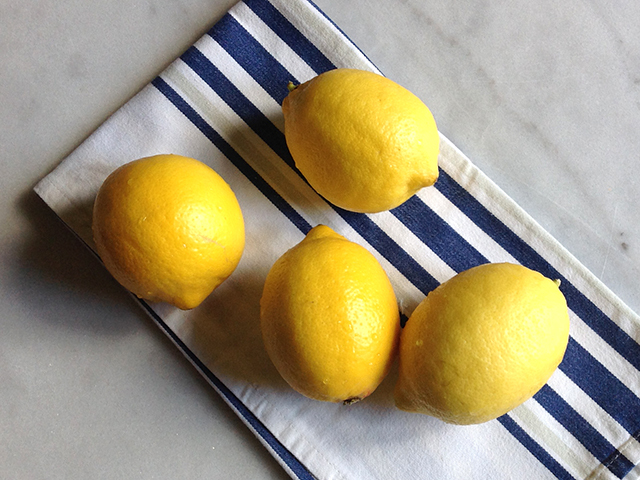 Wash the lemons and make four lengthwise cuts from the top almost all the way to the bottom. 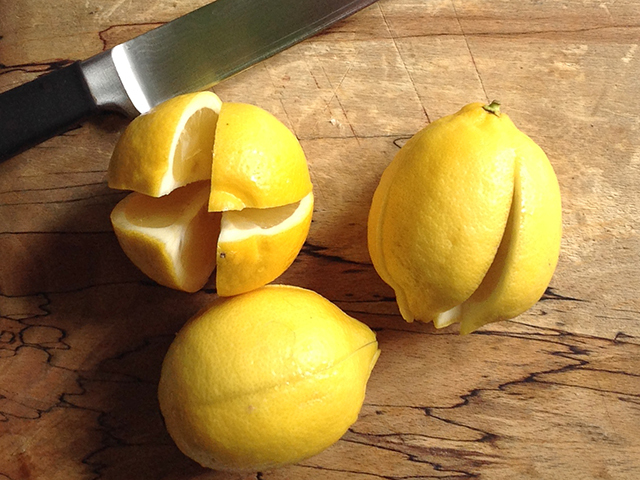 Don’t cut all the way through – you want the lemon to stay in one piece. Stuff each lemon with a tablespoon of salt each. Place the lemons into the jar – squeeze them in tight. Sprinkle a bit of cumin and coriander onto the lemons and add the cascabel chile. Squeeze in the lemon juice (the juice of one lemon for each lemon you’re storing) and close the lid. Store for about 4 weeks before using.